The TruckClaws™ II are a patent-pending, all-season Emergency Vehicle Traction and Recovery aid designed specifically to get your 4WD, Ute, Light Commercial, Truck, SUV, Farm Vehicle or RV unstuck from a bog and on your way in minutes without calling for assistance. Simple to use and easy to install, TruckClaws™ feature a traction cleat that attaches to a drive tyre on the rear of a vehicle with a customized reinforced strap and heavy-duty ratchet. It takes less than 60 seconds to install each claw. You can even add multiple TruckClaws™ to each tyre for even more traction! Other traction aid products are made of plastic and often only good for one or two uses. 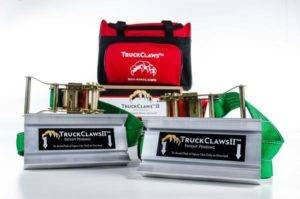 TruckClaws™ and TruckClaws II™ are made of high-quality metal making them one of the best traction aids available due to their effectiveness and their reusability. 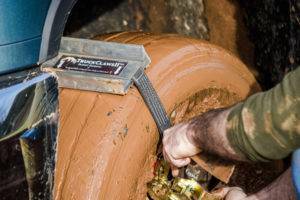 This emergency tyre traction aid will get your vehicle unstuck from sand, mud, snow or ice, fast and safely. Unlike a winch, TruckClaws™ II do not require a nearby tree, rock or vehicle to tie off to and unlike most recovery systems which will get you out of a hole, TruckClaws™ II will get you out of the whole swamp or desert. Each kit comes with two “Claws”, two 1.2m straps, two heavy duty ratchets and a compact carrying case. The whole kit weighs less than 4kg and takes up significantly less room than any other solution.